Qophii Qe’ee Oromoo, Yaa’ii Gumii Caffee Tokkuummaa Abbooti Gadaa Oromo kutaa 1ffaa. 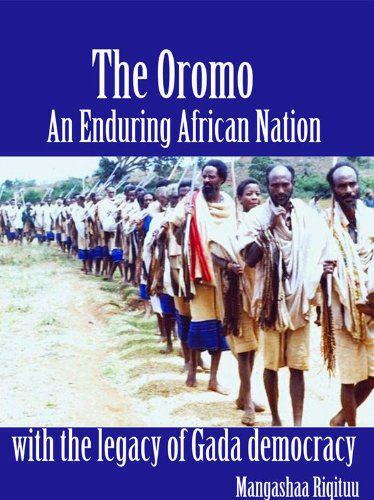 Posted by OromianEconomist in Africa, Gadaa System, Maaddillee Oromo, Munyoo Oromo, Munyoyaya Oromo, Oromiyaa, Oromo, Rayya Oromo, Waata Oromo, Wardei Oromo, Xayyaa Oromo. 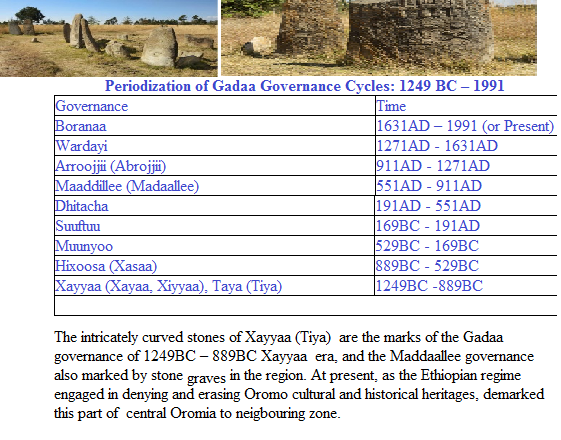 The intricately curved stones of Xayyaa (Tiya) are the marks of the Gadaa governance of 1249BC – 889BC Xayyaa era, and the Maddillee governance also marked by stone graves in the region. 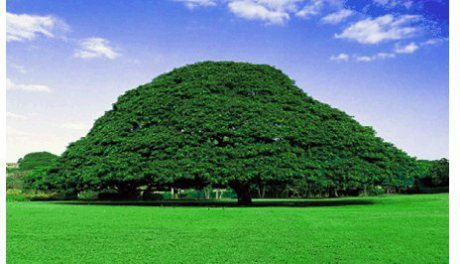 At present, as the Ethiopian regime engaged in denying and erasing Oromo cultural and historical heritages, redistricted this part of central Oromia to neighboring zone. 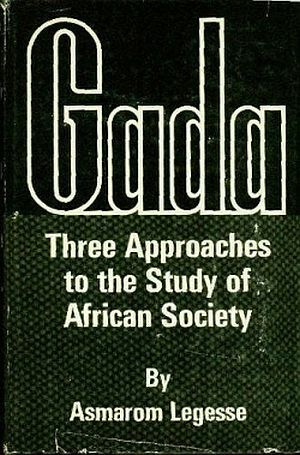 So, in reading the following article we must refer to the above study. January 13, 2015 (Ancient Origins) — The Tiya stones are part of an archaeological site located in central Ethiopia, in an area known as the Gurage Zone. The 46 large, decorated Tiya megaliths have been declared a UNESCO World Heritage Site. Although the construction of such megaliths is an ancient tradition in Ethiopia, the Tiya stones are fairly ‘recent’, dating to sometime between the 10th and 15th centuries. Remarkably little is known about the Tiya stelae, beyond descriptions of their physical appearance. These large monuments likely had some cultural significance when erected, but their meaning remains unclear and very few efforts have been made towards understanding these magnificent monoliths. The town of Tiya is found in central Ethiopia, located in the Soddo Region, in an area known as the Gurage Zone. Over 100 stelae can be found scattered across nine distinct megalithic pillar sites within the zone, 46 of which can be found at Tiya. The pillar sites contain large stelae (monuments) of three types – anthropomorphic, phallic, and non-anthropomorphic/non-phallic. Anthropomorphic stelae are those which are given a human form. Phallic stelae are tall, thin shafts. The final stelae are flat monuments that take on neither an anthropomorphic nor phallic form, yet still take on the same basic form as the other megaliths. Each of these types of stelae are prominent within the nine sites of the Gurage Zone. Additionally, most of the stelae in the Gurage Zone contain elaborate decorations, including symbols that resemble plants, swords, and human figures, standing “akimbo,” with their hands on their hips and elbows turned out. The monoliths at Tiya are taller than the stelae found elsewhere in the zone, with the tallest reaching over 16 feet (5 meters) high. Thirty two of the Tiya stelae bear decorative symbols. In April 1935, one of the Tiya stones, engraved with a sword symbol, was discovered during a German expedition. Local residents refer to the stelae as Yegran Dingay, or Gran’s Stone. This is in reference to the ruler of the Adal Sultanate, Imam Ahmad ibn Ibrahim al-Ghazi. In addition to the stelae at Tiya, there have been other finds of archaeological significance. During excavations, several tombs have been found. In the area, researchers have also discovered tools form the Middle Stone Age. Several sets of remains have been found in the area, with the bodies dating to sometime between the 12th and 14th centuries. Upon examination, it appeared that the remains belonged to individuals who were killed in battle. This may be fitting, as some say that the Tiya stones appear to be laid out like a row of headstones. There has been speculation that these are, perhaps, the site of a mass burial for those killed in battle. The Tiya stelae are similar to stelae found in other areas, such as those that can be found en route between Djibouti City and Loyada. The stelae near Djibouti City include anthropomorphic and phallic stelae, and some of those near Loyada contain a T-shaped symbol. Some of these stelae also contain the symbols found on the Tiya stelae. The Tiya stones were declared to be a UNESCO World Heritage Site in 1980. A UNESCO World Heritage Site is a place that is considered to be of special cultural or physical significance. These worldwide sites are protected in hopes of preserving any cultural significance they may hold. The site of the Tiya stones joins many other UNESCO World Heritage Sites in Ethiopia, including: Axum, Lalibela, Semien Mountains National Park, Fasiledes Castle, the lower Valley of the Awash River, the lower Valley of the Omo, Muslim Holy City Harar, and the Konso Landscape. Altogether, these sites are the important remains of ancient Ethiopian culture, although it has been said that there has not been enough effort towards understanding the archaeology of Ethiopia. Fully understanding the purpose and function of the Tiya stones is difficult because of the small amount of research that has been done in the area. Identification as a UNESCO World Heritage Site should be helpful towards learning more about the stelae, but surprisingly little has been done in the past 35 years since that occurred. Sites such as the Tiya stones should be protected to ensure that any cultural secrets they hold will remain preserved, and perhaps someday be discovered. As a site created by the ancestors of those who live in Tiya and nearby areas, any significance of the megaliths may still apply to those who live there today. By protecting the site, UNESCO and other interested groups can ensure that the stones are preserved for future generations. There is the hope that more research will be undertaken in order to learn more about the amazing megaliths at Tiya, including who constructed them, why they did so, and what significance the monuments hold. 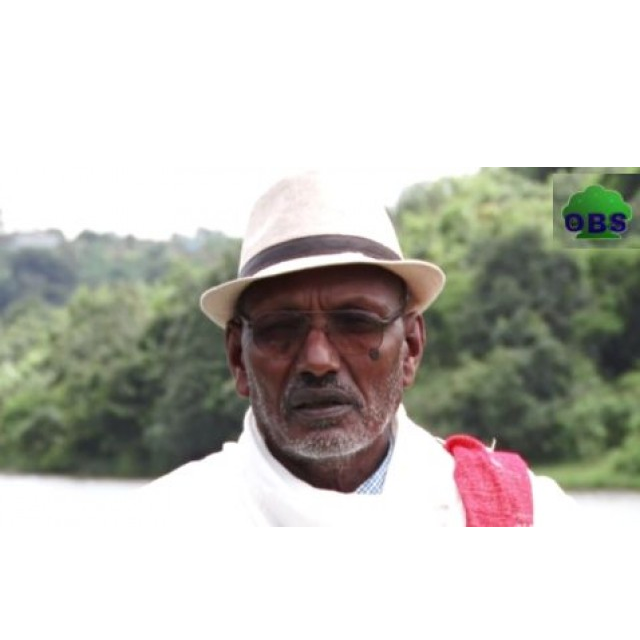 Copyright © OromianEconomist 2015 & Oromia Quarterly 1997-2015, all rights are reserved. Disclaimer.